Reproduced below are the wise words of the sadly departed Dr Richard Carlson, a respected author, psychotherapist and motivational speaker. “Choose your battles wisely” is a popular phrase in parenting but is equally important in living a contented life. It suggests that life is filled with opportunities to choose between making a big deal out of something or simply letting it go, realizing it doesn’t really matter. If you choose your battles wisely, you’ll be far more effective in winning those that are truly important. Certainly there will be times when you will want or need to argue, confront, or even fight for something you believe in. Many people, however, argue, confront, and fight over practically anything, turning their lives into a series of battles over relatively “small stuff.” There is so much frustrationin living this type of life that you lose track of what is truly relevant. The tiniest disagreement or glitch in your plans can be made into a big deal if your goal (conscious or unconscious) is to have everything work out in your favour. This is nothing more than a prescription for unhappiness and frustration. The truth is, life is rarely exactly the way we want it to be, and other people often don’t act as we would like them to. Moment to moment, there are aspects of life that we like and others that we don’t. There are always going to be people who disagree with you, people who do things differently, and things that don’t work out. If you fight against this principle of life, you’ll spend most of your life fighting battles. A more peaceful way to live is to decide consciously which battles are worth fighting and which are better left alone. If your primary goal isn’t to have everything work out perfectly but instead to live a relatively stress-free life, you’ll find that most battles pull you away from your most tranquil feelings. Is it really important that you prove to your spouse that you are right and she/he is wrong, or that you confront someone simply because it appears as though he or she has made a minor mistake? Does your preference of which restaurant or movie to go to matter enough to argue over it? Take a look at your own list – you might want to reevaluate your priorities. 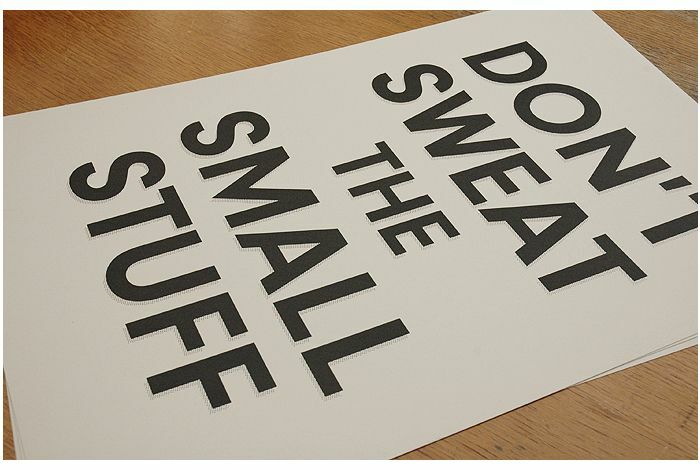 If you don’t want to “sweat the small stuff,” it’s critical that you choose your battles wisely. If you do, there will come a day when you’ll rarely feel the need to do battle at all. I guess we could call this the reverse-Larry David principal ! This entry was posted in General and tagged Choose Your Battles, Don't Sweat, Richard Carlson by djh. Bookmark the permalink.